The thing is he must be put strait 2 on the spot, no mere waterstichystuff in a selfmade world that you can’t believe a word he’s written in, not for pie, but one’s only owned by naturel rejection. Charley, you’re my darwing! So sing they sequent the assent of man. Till they go round if they go roundagain before breakparts and all dismissed. They keep. Step keep. Step. Stop. Who is Fleur? Where is Ange? Or Gardoun? It was in 1994 that my late friend and Friends of Charles Darwin co-founder, Fitz, came up with our Charlie is our Darwin motto: a pun on Robert Burns’s Charlie, He’s My Darling—a song about Bonnie Prince Charlie. I’m pretty sure Fitz would have been delighted to hear he’d been pre-empted by 55 years by none other than James Joyce. 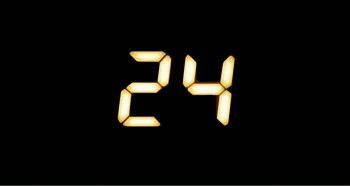 24 not out… So, what next? Today (2nd March 2018) marks the Friends of Charles Darwin’s 24th birthday. Happy birthday to us! 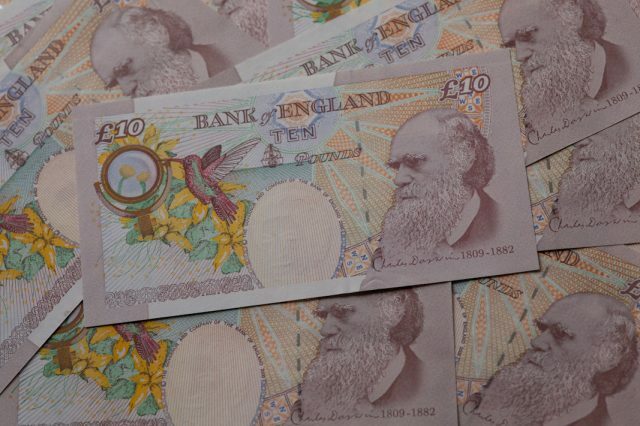 At midnight last night, the Charles Darwin £10 note, for which we originally campaigned, finally became extinct. Time, perhaps for something of a relaunch. Although you’d never guess it from appearances, I’ve been working hard behind the scenes over the last few months, making numerous much-needed improvements to the website. I’ll spare you the technical details, but the Reviews and Articles sections will be a lot easier for me to maintain in future. I’ve also converted some of the old, blog posts into proper articles—especially those that celebrate anniversaries of one form or another, which might come in handy again in future years. I’ll keep making improvements to the website over the next few months. The general idea is to bring the site more up to date, and, in particular, to make it more suitable for sharing stuff on social media—which is where all the cool kids hang out these days, apparently. I’m also about to start a Friends of Charles Darwin newsletter. Nothing too spammy, you understand: I’m thinking maybe one newsletter every couple of months or so. So please sign up—even if you already asked to be added to the mailing list when you became a member (after 24 years, our existing mailing list is completely out of date, so it makes sense to start afresh). What else? I guess we’ll find out. But my intention is to start posting more stuff with more regularity on the Friends of Charles Darwin website, Twitter feed, and Facebook page. If you have any suggestions about other things you’d like to see from the Friends of Charles Darwin, please feel free to add a comment below, or to get in touch directly. File under: BlogKeywords: friends of charles darwin (the) · websiteLeave a Comment on 24 not out… So, what next? As extinction events go, the dating of this one is pretty precise: the Bank of England’s Charles Darwin £10 note will cease to be legal tender at 23:59 GMT tonight (1st March 2018). From a personal point of view, the timing of the demise of the Darwin tenner is spectacularly unfortunate, falling as it does precisely one minute before the Friends of Charles Darwin’s 24th birthday. My friend Fitz and I founded the Friends in the Red Lion pub, Parkgate, Wirral on 2nd March 1994, when we wrote to the Bank of England to point out a certain ‘glaring omission’ from their bank notes. Thus began our campaign to see Darwin depicted on a Bank of England note. 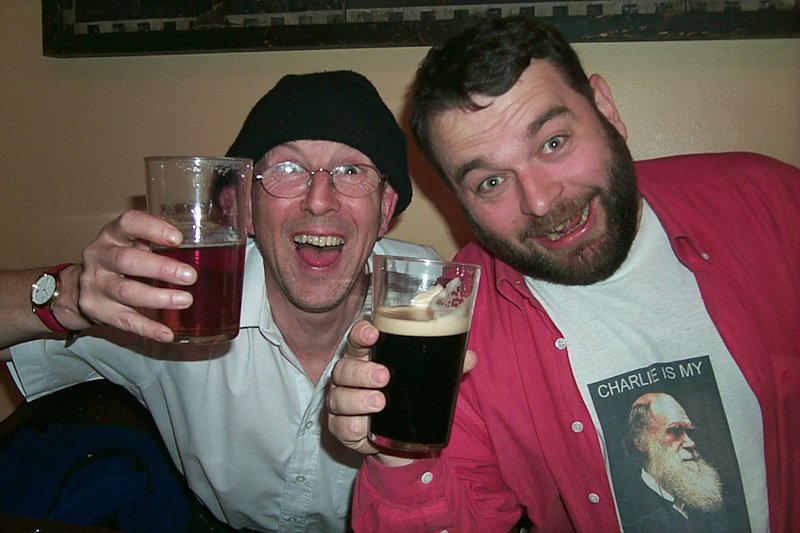 Fitz (L) and me (R), celebrating the announcement of the Darwin tenner. Time moves on at an alarming pace. Is it really 18 years since Fitz and I partied like it was 1999? I am considerably thinner on top and more grey-haired than I was back then, and poor old Fitz is considerably less alive. After he died in 2014, I took steps to ensure he was buried with a crisp Darwin tenner, just in case the ferryman demanded a fare. I miss the daft, old bugger. Considering the Friends of Charles Darwin were created with the sole aim of seeing our hero celebrated on a bank note, and considering we got precisely what we wanted almost 18 years ago, it could be argued we’ve long outlived our purpose. But, what the hell, there are plenty more self-confessed Darwin groupies out there, so I might as well keep this thing going a while longer. So, if Charlie is your Darwin, and you haven't done so already, please feel free to join us. Oh, and I’m thinking of starting a newsletter, so please sign up—even if you're already a member (after 24 years, our existing mailing list is very old, and completely out of date, so I thought I should start it afresh). 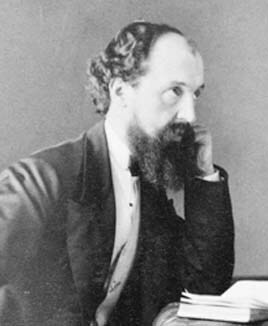 In December 2013, while visiting one of my favourite second-hand book shops with a friend, I came across a first edition of the essay collection New Fragments by one of Charles Darwin’s close friends, the physicist John Tyndall. I think I may know the story behind those words...will get back to you later tomorrow. [T]here’s an outside chance that your book is inscribed by [the mathematician] Thomas [Archer] Hirst. 15 January was publication day and he might have risen from his sickbed to get a copy. He died on 16 February. Tyndall at the time was confined to Hindhead, and the writing isn’t his wife’s (who might have gone to get it but I think there’s no mention in the diary) or his I think. I attach the only really contemporary letter of Hirst’s we have. His writing seems to have changed quite a bit as he got more and more ill. There are resemblances but I’m not sure strong enough to be definitive. See what you think, making allowances for a sick man scrawling it on his bed. 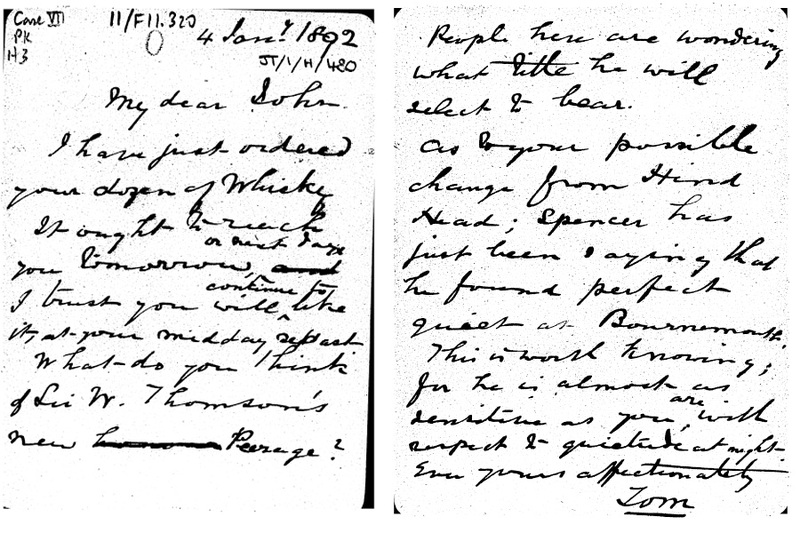 Letter from Thomas Archer Hirst to John Tyndall, 04-Jan-1892. Reproduced by courtesy of the Royal Institution of Great Britain. I have just ordered your dozen of Whisky It ought to reach you tomorrow, or next day, I trust you will continue to like it, at your midday repast. What do you think of Sir W. Thomson’s new Peerage? People here are wondering what title he will select to bear. As to your possible change from Hind Head; Spencer has just been saying that he found perfect quiet at Bournemouth. This is worth knowing; for he is almost as sensitive as you are, with respect to quietude at night. A letter concerning whisky, containing gossip about the future Lord Kelvin, and with word from (presumably) Herbert Spencer: right up my street! 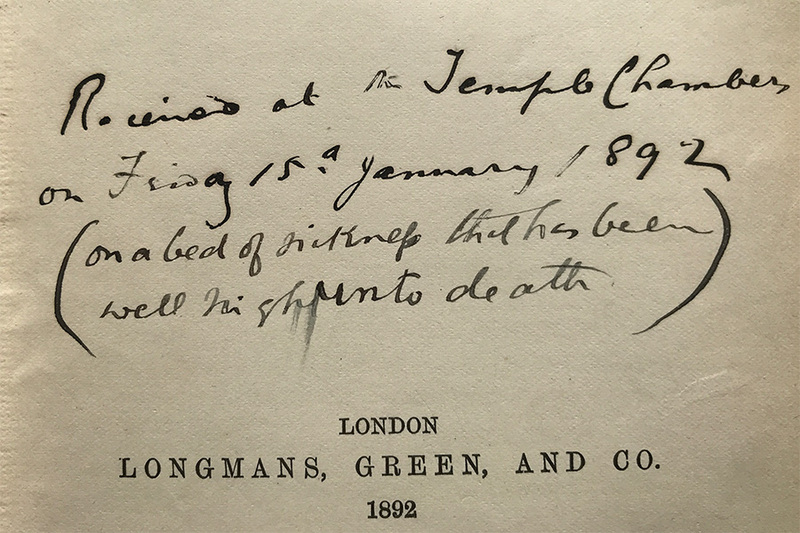 (less convincingly) the upper-case ‘T’s in ‘Thomson’ and ‘Tom’ in the letter are similar in style to the upper-case ‘T’ in ‘Temple’ in the book inscription. Whoever wrote the inscription in my book was sufficiently interested in the writing of John Tyndall to take delivery of his latest book from their sickbed on the very day it was published. Hirst, being a very close friend of Tyndall, and a voracious science-reader would seem to fit that bill very nicely. Do I think this conclusively proves my morbid book inscription was indeed written by Tyndall’s dear friend Thomas Archer Hirst? No I don’t. But do I strongly suspect it was? You betcha! I couldn’t let the opportunity occasioned by writing about Thomas Archer Hirst and John Tyndall go by without relating a couple of personally interesting co-incidences about their friendship. While I was researching Tyndall for my book, I learnt that he and Hirst first became friends as young men while surveying a proposed railway line between Halifax and Keighley, West Yorkshire. Those towns both lie just 20 minutes’ drive from my home. More pleasing, however, was it to discover that the man they both worked for was my namesake, the land agent and surveyor Richard Carter. Read more about John Tyndall (and Charles Darwin, Robert FitzRoy, Sir Thomas Browne, Celtic languages, evolution’s kludgy compromises, wheatears, triangulation, Ted Hughes, Sylvia Plath, grouse disease, defining species, DNA barcoding, the Laws of Thermodynamics, the Brontës, snipe courtship, skeletons, rooks, the Greenhouse Effect, blue skies, the songs of skylarks, contrails, and much more) in my book On the Moor: Science, History and Nature on a Country Walk. Nine years ago today, I planted the Darwin Bicentennial Oak in my garden. I am pleased to report that it is still doing well. I have now spent nine years gathering material for the longest time-lapse movie ever. Or should that be shortest?